ATTENTION: Because of fluctuations in river levels, the water sometimes flows higher and faster than we deem safe. Trips will sometimes need to be cancelled but rebooking or refunds will be provided. More information on water levels can be found at the USGS site for Wisconsin or Illinois. Please check back frequently or contact us for more info. The lower canyon of the Kinnickinnic River is a natural spring-fed class I trout stream that runs from River Falls to the St. Croix River. The river has little to no development and is actively protected by the Kinnickinnic River Land Trust. The lower canyon has wider and swifter waters than the upper portion and has a few difficult turns along the way. New for 2017! 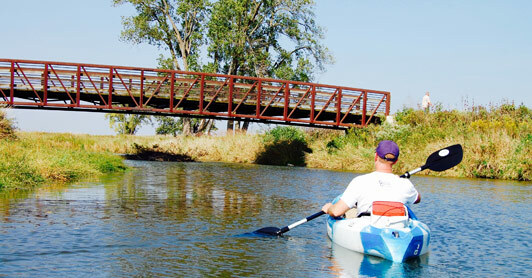 The Nippersink Creek is a beautiful kayak river within a short distance of Chicago, Milwaukee, Kenosha, and Racine. Guests will meet our staff at the Pioneer Landing, where we’ll shuttle them in our van to Keystone Road landing. More info about the Nippersink can be found at the McHenry County Conservation District. Bring a seasoned River Guide along with your group to help with navigation, technique, and help point out sights along the way. Have your own kayak or canoe already but don’t want to deal with the mess of multiple vehicles and shuttling? Let us do it for you. Call or email for more details.